Coming to Boulder for a solo adventure, or maybe looking for things to do while your travel companion is in meetings? 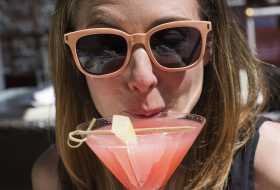 Boulder was named one of the best cities in the U.S. for solo travelers, so you’ll be right at home here. Boulder’s super walkable, safe, welcoming and has an independent streak. Really, you can go just about anywhere in this town by yourself, but here are some ideas! Pearl Street – A brick-paved street that’s closed to traffic and lined with shops and eateries. You’ll want to find a bench and people watch for a while, then shop ‘til you drop. Boulder Farmers Market – One of the nation’s best. Saturday mornings, April-November, and Wednesdays evenings, May-October. Boulder Dushanbe Teahouse – A stunning structure gifted to Boulder by her sister city in Tajikistan. Go inside to look around and have a cup of tea by the fountain. Museum of Boulder – Explore Boulder’s fascinating past, present and future through fascinating, interactive exhibits. There are dozens of trails right in the city of Boulder, and many that are just five minutes from downtown, so it won’t feel like you’re headed into the boonies (although we have hikes that do, if that’s what you’d prefer). If you start at the Chautauqua Trailhead, you can stop in the Ranger Cottage for trail recommendations and let them know where you’re headed. 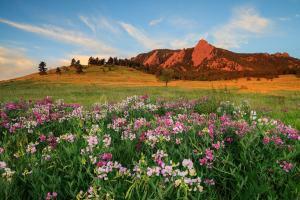 Then wind your way up into Boulder’s iconic Flatirons and gaze back at the city below. What a luxury to sit and read uninterrupted while sipping a latte! Boulder is a tech startup hub, and there are so many freelancers and entrepreneurs here that consider the coffee shop their second office that you won’t feel a bit out of place sitting solo. The city of Boulder hosts free, guided hikes regularly on topics like bald eagle viewing, stargazing and ecology. Just check naturehikes.org for a schedule and feel free to join in. 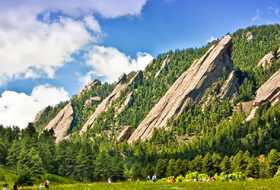 Boulder is one of the most active cities in the country, so you will find just about every kind of group activity on meetup.com: hiking, cycling, rock climbing and more. 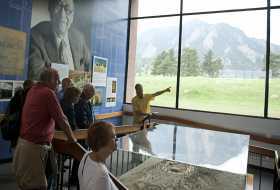 Whether you want to bike to a farm, see the city from an electric bike, go on a chocolate-tasting tour, learn Boulder’s history while riding a hillbilly shack on wheels, or see inside the National Oceanic and Atmospheric Administration (where weather is predicted), Boulder’s tour guides tend to be a warm and welcoming bunch. Find lots more options here. Why not use your alone time to go inward? While some communities have a church on every corner, Boulder has a yoga studio on just about every corner. And we have yet to find one that doesn’t welcome drop-ins. Crank up the tunes (whatever your heart desires because it&apos;s just you, right?) and hit the road to cruise through some of the most beautiful scenery in Colorado. 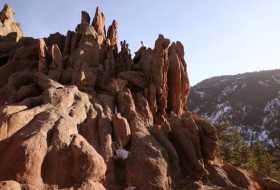 The Peak to Peak Scenic and Historic Byway is easy to access from Boulder, just head up Canyon Blvd. from downtown Boulder and drive for about 30 minutes until you get to Nederland, then turn north on Hwy. 72. 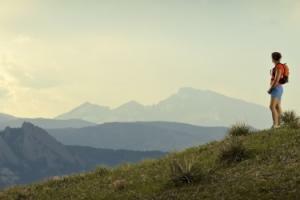 Or drive through some of Boulder County&apos;s most scenic farmland, with mountain backdrops and farm stands along the way. There are lots more scenic drives listed here. If you’re looking to just grab a seat and make conversation with the bar staff, look no further than the beautifully designed perch at Salt. Other great counters: Brasserie Ten Ten, Pizzeria Locale or Oak at Fourteenth. Looking for a nice, sit-down meal at a table of your own? You can’t go wrong with the home-cooked food at The Kitchen, intimate Japanese cuisine at Amu or cozy and comforting Bramble and Hare. At Rayback Collective, Boulder&apos;s food truck park, you grab your food from one of the mobile vendors and then enjoy it at a picnic table or beside a firepit — perfect spots to meet some new friends. A huge indoor bar is another great place to take your food. Order at the counter and grab a table and enjoy good-for-you cuisine Fresh Thymes, a nourishing and beautiful dish at Flower Child, killer gourmet subs at Organic Sandwich, Chinese street food at Zoe Ma Ma or brothy noodle bowls at Flower Pepper. Plan a "Weekend of You"
Thrifters rejoice! Boulder has the best secondhand shops.